Thanks for stopping by! Today, members of the ODBD Design Team are sharing new inspiration with the products from the December Release. I created a Clean and Layered card using the Pennant Flag Verses stamp set, Pennant Flags and Double Stitched Pennant Flags die sets along with previously released ODBD Custom Dies and the Old Glory Paper Collection (see supply list below). LOVE this! Who woulda' thunk you could layer like that! 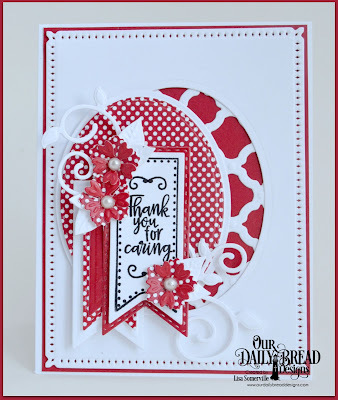 Lisa, love your creative layering on this CAL card! The red really pops against the white and looks so crisp and clean :-) Thanks for the inspiration that you are to all of us- hugs and have a blessed Christmas, my friend! Beautiful card! Thx for sharing. Love this CAL card, Lisa! !